A recent project I received from an advertising agency in Istanbul. 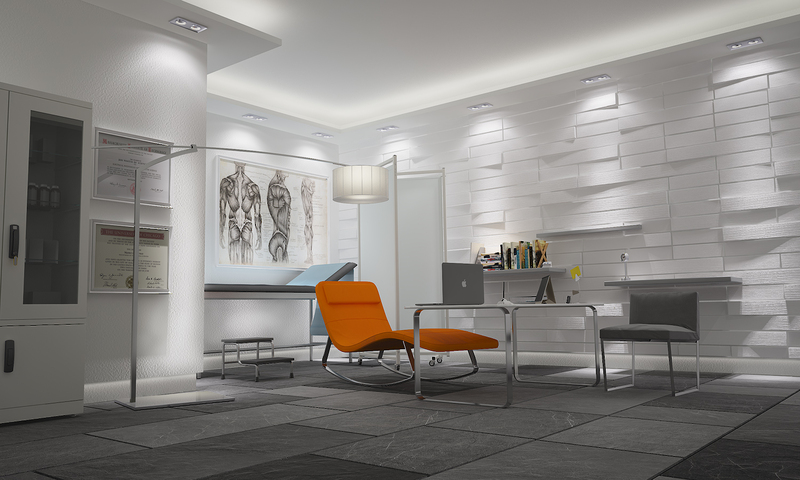 The brief was to create a bright and spacious doctor’s office with an orange chaise longue in the center instead of a doctor’s armchair. The advertising agency’s client is Brequal, an inhaler for asthma patients. The chaise longue, I believe, represents comfort. But do not ask me why the setting is a doctor’s office :) We shall see the reason why in the following days, I suppose. For the feeling of space, I created a room with high ceilings and added a LED pool to enhance the feeling further. There are several double spots around the pool and for them I used a VRay IES light with pre-settings. The wall on the right is created using RailClone 2 (the liteversion). There are only three wooden planks I modeled (because 3 segments is all that Railclone 2 lite allows you to use, although I used several mirror and transform operators in order to get more randomization) and they are assigned a white wood material with a seamless bump map which creates the natural sensation. The floor is also created using RailClone 2. For that I modeled three tiles of differing widths (120×30, 120×75, 120×45 cm) and used the MultiTexture in the diffuse channel of the tiles, a plugin which is free (and can be acquired from here, but the website requires you to sign up). MultiTexture is a powerful tool if you need to assign random textures to objects. I opted for an embedded LED light following the skirts in order to achieve the ‘spacious’ requirement of the brief. The LED lights are merely splines with thickness following the walls (or wherever you want them to be) with a VrayLightMaterial assigned to them. Waiting to hear your comments ! Posted in InteriorsTagged 3D, 3dsmax, architectural, architecture, armchair, bump, chaise, doctor, ies, interiors, LED, lighting, longue, medic, multitexture, office, railclone, tiles, velvet, vrayBookmark the permalink.